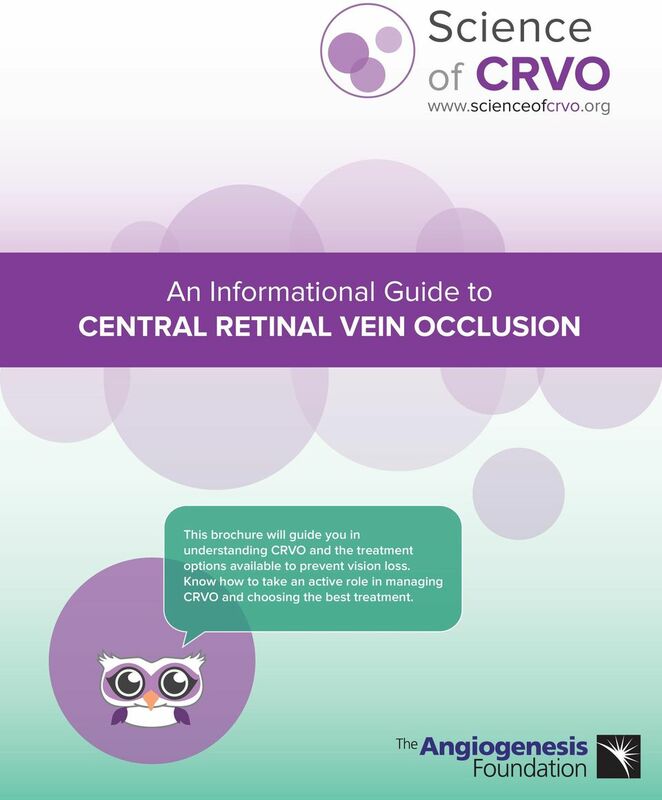 Download "An Informational Guide to CENTRAL RETINAL VEIN OCCLUSION"
1 Science of CRVO An Informational Guide to CENTRAL RETINAL VEIN OCCLUSION This brochure will guide you in understanding CRVO and the treatment options available to prevent vision loss. Know how to take an active role in managing CRVO and choosing the best treatment. 4 YOUR ROLE: Become Empowered RISK FACTORS A risk factor is anything that affects the chances of getting a disease. 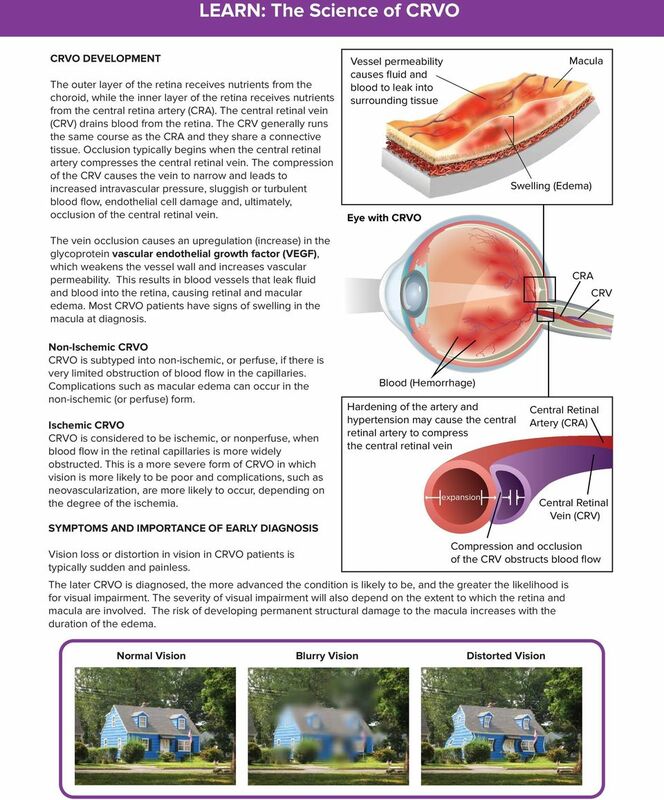 The major global risk factors for CRVO include: Age Hypertension Glaucoma The association between CRVO and other medical conditions is not yet clearly understood. Other factors that are commonly associated with the risk for CRVO include cardiovascular disease, hypercoagulability, and end-organ damage from hypertension or diabetes. FOR PATIENTS: WHAT YOU CAN DO There are steps that you can take to prevent or delay vision loss, and manage your condition and treatment: If you have not been diagnosed with CRVO but suspect that some of the risk factors may apply to you, go see the appropriate doctors and get tested for hypertension, vascular disorders, and glaucoma. Control any modifiable risk factors that you may have. If you are diagnosed with CRVO, get tested for systemic risk factors, such as hypertension or diabetes. Treating systemic conditions is critical for preventing serious health complications in the future. If diagnosed with CRVO, get regular check-ups to monitor progression of the condition. Get regular check-ups to test for and measure the presence of edema with an eye care professional. TESTING Three common tests can detect and identify the extent of CRVO: funduscopy, fluorescein angiography and optical coherence tomography. Fundoscopy: This test uses a hand-held ophthalmoscope to identify retinal hemorrhage or other abnormalities that indicate the presence of CRVO. A non-specialist can perform a funduscopy. Fluorescein angiography (FA): If CRVO is found, an eye care specialist will perform a fluorescein angiography (FA). FA is a test that takes images of the eye to evaluate the blood flow in the back of the retina. FA can identify the areas of capillary nonperfusion, leakage, and hemorrhage, which can affect treatment strategies. This procedure involves pupil dilation and an injection of a special vegetable dye called fluorescein into the arm. Optical Coherence Tomography (OCT) OCT is a non-invasive imaging test that measures the thickness of the retina and identifies the extent of edema in the retina and macula. It is a special camera that uses light to take cross section images of the inner parts of the eye. 6 ANTI-VEGF TREATMENTS: Clinical Data Eylea (Aflibercept) The pivotal phase III COPERNICUS and GALILEO studies involved nearly 360 patients with macular edema from CRVO and demonstrated that after 24 weeks of treatment, monthly injections of 2 mg of Eylea had greatly improved vision compared to patients without treatment. At 24 weeks, 56% of patients in the COPERNICUS study and 60% of patients in the GALILEO study gained at least 15 letters in vision (compared to 12% of patients without treatment in the COPERNICUS study and 22% of patients without treatment in the GALILEO study). Retinal thickness decreased by an average of μm in the COPERNICUS study, and by an average of μm in the GALILEO study (compared to a reduction of only μm in patients without treatment in the COPERNICUS study and a reduction of only μm in the GALILEO study). 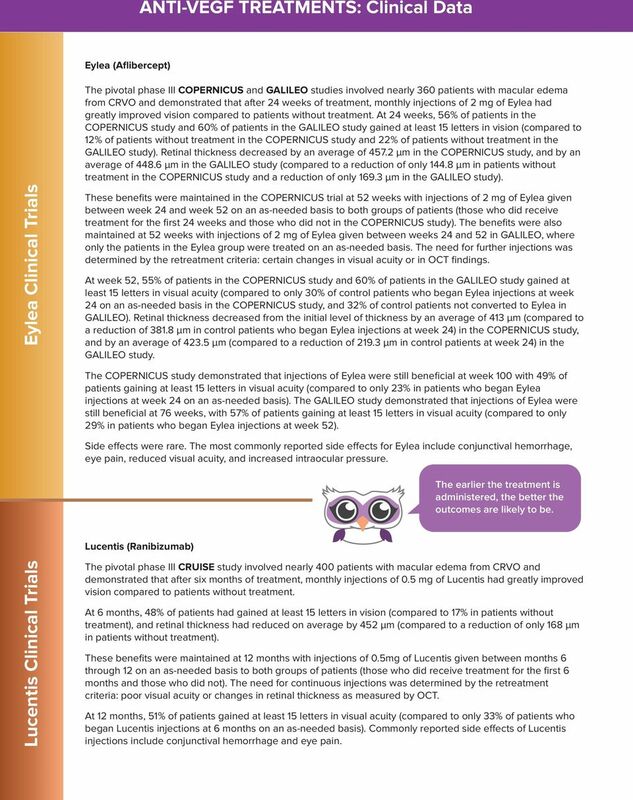 Lucentis Clinical Trials Eylea Clinical Trials These benefits were maintained in the COPERNICUS trial at 52 weeks with injections of 2 mg of Eylea given between week 24 and week 52 on an as-needed basis to both groups of patients (those who did receive treatment for the first 24 weeks and those who did not in the COPERNICUS study). The benefits were also maintained at 52 weeks with injections of 2 mg of Eylea given between weeks 24 and 52 in GALILEO, where only the patients in the Eylea group were treated on an as-needed basis. The need for further injections was determined by the retreatment criteria: certain changes in visual acuity or in OCT findings. At week 52, 55% of patients in the COPERNICUS study and 60% of patients in the GALILEO study gained at least 15 letters in visual acuity (compared to only 30% of control patients who began Eylea injections at week 24 on an as-needed basis in the COPERNICUS study, and 32% of control patients not converted to Eylea in GALILEO). Retinal thickness decreased from the initial level of thickness by an average of 413 μm (compared to a reduction of μm in control patients who began Eylea injections at week 24) in the COPERNICUS study, and by an average of μm (compared to a reduction of μm in control patients at week 24) in the GALILEO study. The COPERNICUS study demonstrated that injections of Eylea were still beneficial at week 100 with 49% of patients gaining at least 15 letters in visual acuity (compared to only 23% in patients who began Eylea injections at week 24 on an as-needed basis). The GALILEO study demonstrated that injections of Eylea were still beneficial at 76 weeks, with 57% of patients gaining at least 15 letters in visual acuity (compared to only 29% in patients who began Eylea injections at week 52). Side effects were rare. The most commonly reported side effects for Eylea include conjunctival hemorrhage, eye pain, reduced visual acuity, and increased intraocular pressure. Lucentis (Ranibizumab) The earlier the treatment is administered, the better the outcomes are likely to be. The pivotal phase III CRUISE study involved nearly 400 patients with macular edema from CRVO and demonstrated that after six months of treatment, monthly injections of 0.5 mg of Lucentis had greatly improved vision compared to patients without treatment. At 6 months, 48% of patients had gained at least 15 letters in vision (compared to 17% in patients without treatment), and retinal thickness had reduced on average by 452 μm (compared to a reduction of only 168 μm in patients without treatment). These benefits were maintained at 12 months with injections of 0.5mg of Lucentis given between months 6 through 12 on an as-needed basis to both groups of patients (those who did receive treatment for the first 6 months and those who did not). The need for continuous injections was determined by the retreatment criteria: poor visual acuity or changes in retinal thickness as measured by OCT. At 12 months, 51% of patients gained at least 15 letters in visual acuity (compared to only 33% of patients who began Lucentis injections at 6 months on an as-needed basis). Commonly reported side effects of Lucentis injections include conjunctival hemorrhage and eye pain. 7 OTHER TREATMENTS OTHER AVAILABLE TREATMENTS Steroids Steroids can stabilize the vessel wall, reduce vascular permeability and inhibit VEGF-expression a promoter of macular edema. They can be received as an intravitreal injection or through a sustained-release implant. Corticosteroid Therapy Intravitreal Injection Intravitreal Implant Advanc Disease Intravitreal Triamcinolone Acetonide (IVTA) IVTA has been shown to offer temporary visual improvement in CRVO patients in the short-term. IVTA can significantly improve visual acuity within one year in CRVO patients when compared to no treatment. These benefits are temporary and subsequent treatment every few months may be required to maintain them. 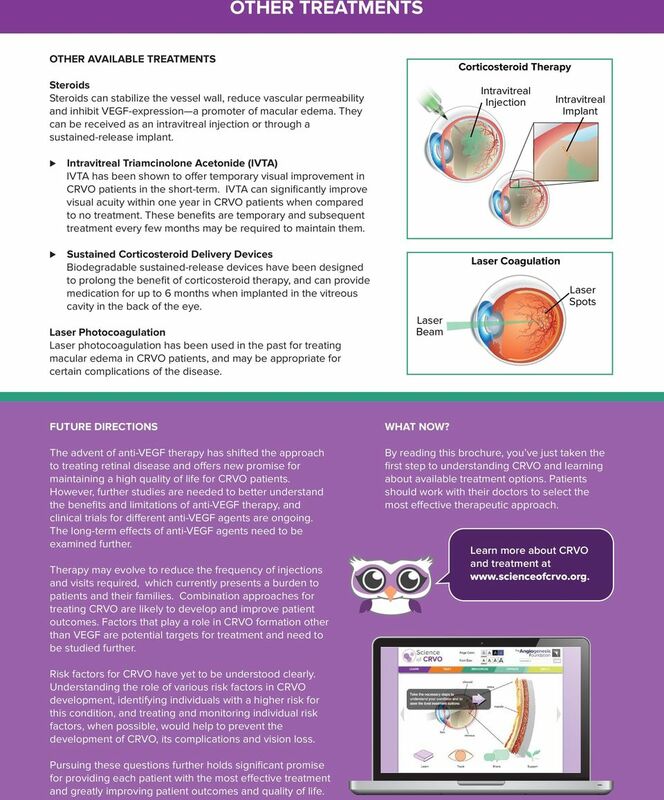 Sustained Corticosteroid Delivery Devices Biodegradable sustained-release devices have been designed to prolong the benefit of corticosteroid therapy, and can provide medication for up to 6 months when implanted in the vitreous cavity in the back of the eye. Laser Photocoagulation Laser photocoagulation has been used in the past for treating macular edema in CRVO patients, and may be appropriate for certain complications of the disease. Laser Beam Laser Coagulation Laser Spots FUTURE DIRECTIONS WHAT NOW? The advent of anti-vegf therapy has shifted the approach to treating retinal disease and offers new promise for maintaining a high quality of life for CRVO patients. However, further studies are needed to better understand the benefits and limitations of anti-vegf therapy, and clinical trials for different anti-vegf agents are ongoing. The long-term effects of anti-vegf agents need to be examined further. Therapy may evolve to reduce the frequency of injections and visits required, which currently presents a burden to patients and their families. Combination approaches for treating CRVO are likely to develop and improve patient outcomes. Factors that play a role in CRVO formation other than VEGF are potential targets for treatment and need to be studied further. 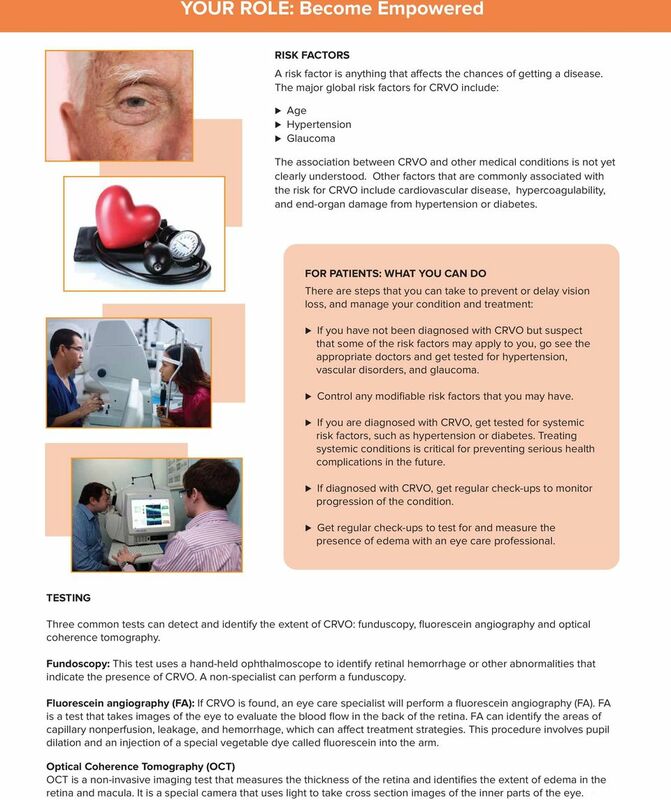 By reading this brochure, you ve just taken the first step to understanding CRVO and learning about available treatment options. Patients should work with their doctors to select the most effective therapeutic approach. Learn more about CRVO and treatment at Risk factors for CRVO have yet to be understood clearly. 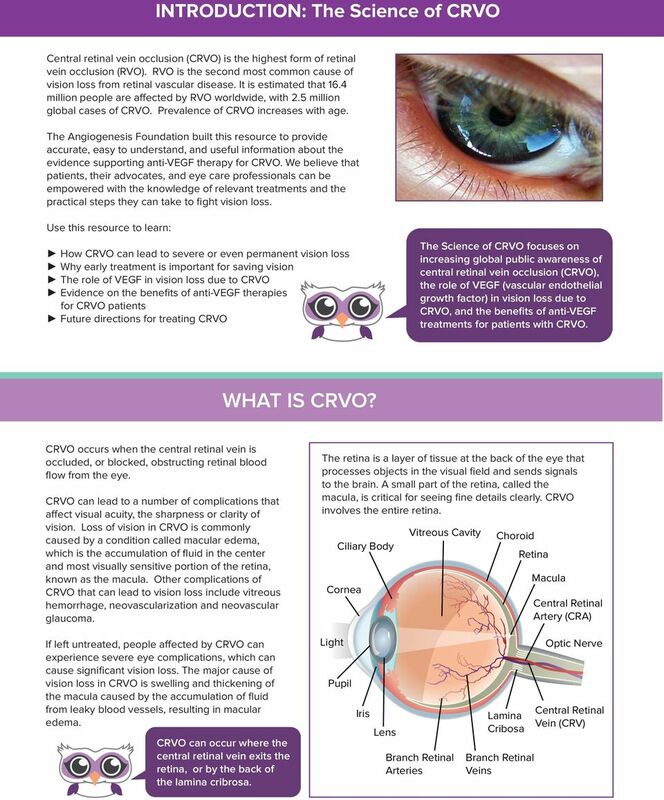 Understanding the role of various risk factors in CRVO development, identifying individuals with a higher risk for this condition, and treating and monitoring individual risk factors, when possible, would help to prevent the development of CRVO, its complications and vision loss. Pursuing these questions further holds significant promise for providing each patient with the most effective treatment and greatly improving patient outcomes and quality of life. 8 The Angiogenesis Foundation is the world s first and leading nonprofit organization dedicated to conquering diseases using a groundbreaking approach based on angiogenesis, the growth of new blood vessels in the body. Angiogenesis is the common denominator in overall health. Our mission at the Angiogenesis Foundation is to improve health globally, through education and advocacy, and to empower patients to take an active role in fighting vision loss. 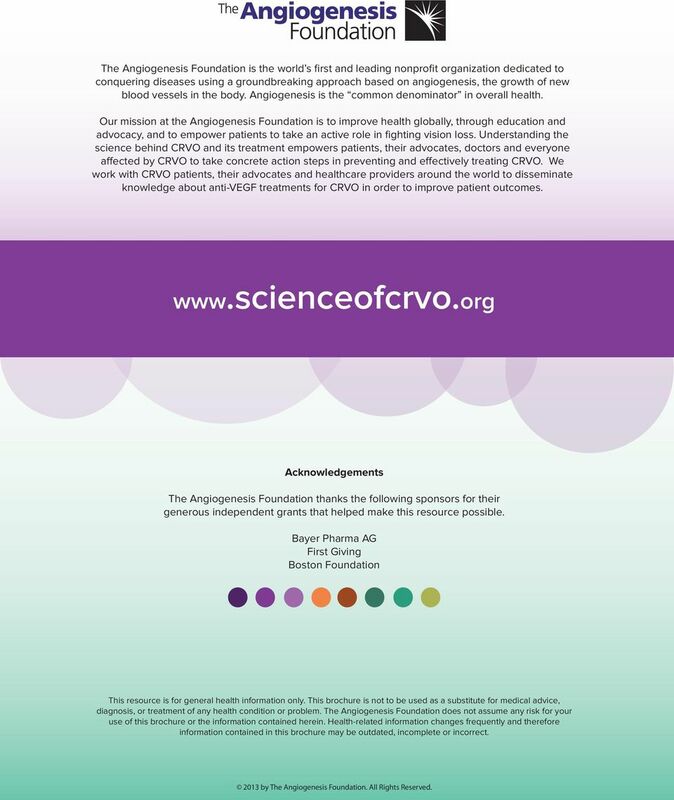 Understanding the science behind CRVO and its treatment empowers patients, their advocates, doctors and everyone affected by CRVO to take concrete action steps in preventing and effectively treating CRVO. 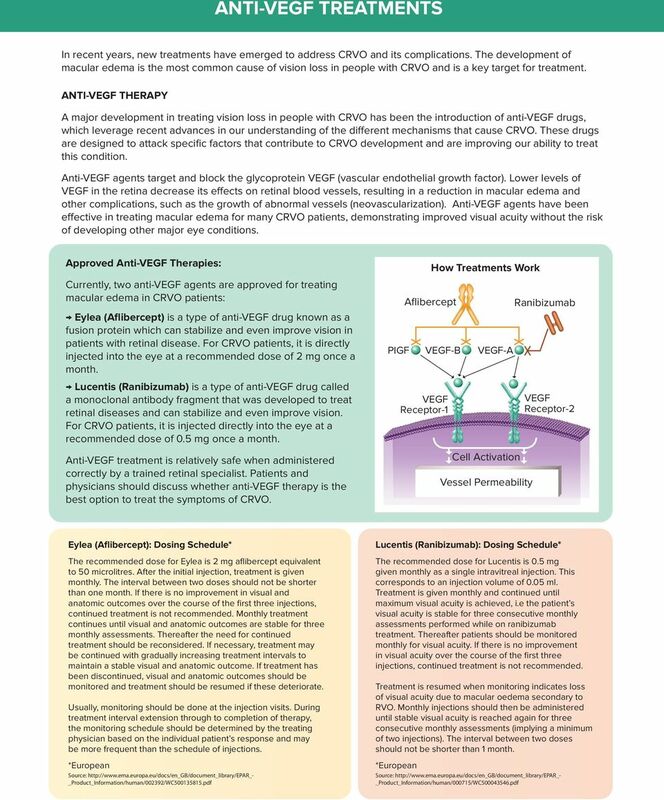 We work with CRVO patients, their advocates and healthcare providers around the world to disseminate knowledge about anti-vegf treatments for CRVO in order to improve patient outcomes. Acknowledgements The Angiogenesis Foundation thanks the following sponsors for their generous independent grants that helped make this resource possible. Bayer Pharma AG First Giving Boston Foundation This resource is for general health information only. This brochure is not to be used as a substitute for medical advice, diagnosis, or treatment of any health condition or problem. The Angiogenesis Foundation does not assume any risk for your use of this brochure or the information contained herein. Health-related information changes frequently and therefore information contained in this brochure may be outdated, incomplete or incorrect by The Angiogenesis Foundation. All Rights Reserved. Science of DME. Diabetic Macular Edema. A Patient Guide to LEARN, TRACK, SHARE. News Release - 1/5 - Bayer Yakuhin, Ltd. Santen Pharmaceutical Co., Ltd. Which eye conditions can avastin injections be used for? PERIOCULAR (SUBTENON) STEROID INJECTION ERIC S. MANN M.D.,Ph.D. We are on WHAT ARE THE RISK FACTORS FOR MACULAR DEGENERATION? or in this case actually things that can sort of look like macular degeneration but aren t.
Age-Related Macular Degeneration. K. Bailey Freund, M.D. James M. Klancnik, Jr., M.D. Lawrence A. Yannuzzi, M.D. Bruce Rosenthal, O.D. Glaucoma. About glaucoma. How does glaucoma occur?